When I look for baby storytime books, I look for books that are fairly short (or can be pretty easily shortened), books that have some kind of interactive element (counting together, an action we can all do together, a refrain that everyone can repeat with me), and/or books that I can sing. One of my goals in baby storytime is to expose kids and parents to a range of different books and to model how to read to babies. Finding books that fulfill these criteria can be hard enough, but looking for diverse titles (titles featuring people of color, titles set in other countries, titles written or illustrated by people of color) makes the task this much harder. So, without further ado, here are some of my favorite diverse titles to use in baby storytime! 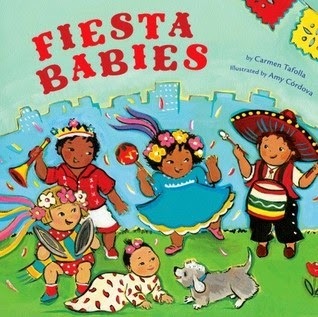 Fiesta Babies by Carmen Tafolla, illustrated by Amy Córdova (Tricycle Press, 2010). This bouncy readaloud features colorful illustrations of babies on parade and includes some Spanish words in the text. Hush! : A Thai Lullaby by Minfing Ho, illustrated by Holly Meade (Scholastic, 1996). This sweet, quiet story has a nice rhythm to it as a mother tries to make things quiet for her little one to sleep. I don't read the whole thing, but a few of the animal spreads and then skip to the end. This is a fun one for making animal sounds, too. 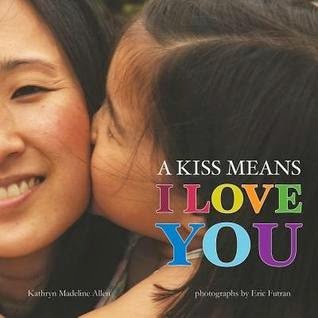 A Kiss Means I Love You by Katherine Madeline Allen, photographs by Eric Futran (Albert Whitman & Co, 2012). This book features large photographs of kids of all colors exploring common gestures and what they mean. A kiss, a wave, a frown... your families can do these gestures with you as you read, and most babies love to look at pictures of children. Leo Loves Baby Time by Anna McQuin (Charlesbridge, 2014). Young children are often very interested in books that reflect what they do each day, which makes this book a great choice for baby storytime. As you read about Leo's storytime experience, talk about the activities that your baby storytimers are doing, too. Look at the Baby by Kelly Johnson (Henry Holt, 2002). Here's another book featuring diverse baby faces, something my baby storytimers are always into! 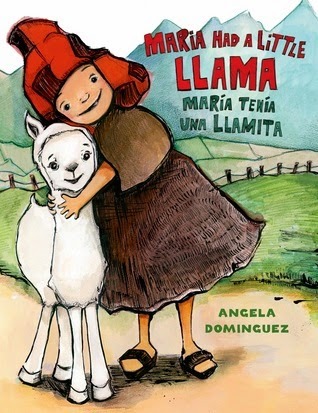 Maria Had a Little Llama by Angela Dominguez (Henry Holt, 2013). Here you'll find the familiar song Mary Had a Little Lamb, set in Peru with a llama. Invite your storytime grown-ups to sing along. Old Mikamba Had a Farm by Rachel Isadora (Nancy Paulsen Books, 2013). This Old MacDonald book is set in Africa and features African animals. This is a great book for singing, learning some new words, and practicing some different animal sounds. Peekaboo Morning by Rachel Isadora (Putnam Juvenile, 2002). In this fun book, we do peekaboo on every page as we meet different members of the family. This is a great title for encouraging patron interaction - babies love to peekaboo. Please, Baby, Please by Spike Lee & Tonya Lewis Lee, illustrated by Kadir Nelson (Simon & Schuster, 2006). I love the bouncing, rhythmic text of this book, which also features many things babies do every day. Parents always laugh along at the familiar behaviors they see illustrated in this book. Round is a Tortilla: A Book of Shapes by Roseanne Thong, illustrated by John Parra (Chronicle Books, 2013). I definitely shorten the text of this book, reading about one or two shapes. Make this one interactive by handing out foam shapes or shape toys to your listeners so they can explore the shapes close-up while you read about them. These are some of my favorite diverse titles for baby storytime. WHAT AM I MISSING?? Please add your favorites in the comments!